I hope this initial communication finds you and yours all well and surviving the winter as best you can. I know it has been brutal for many of us on many levels all over the U.S., though I promise, there’s light at the end of the tunnel - here in Orange County, NY, it’s going to reach 50 degrees by the end of the week, which will certainly help in melting the 28” of snow that’s fallen over the past three days! 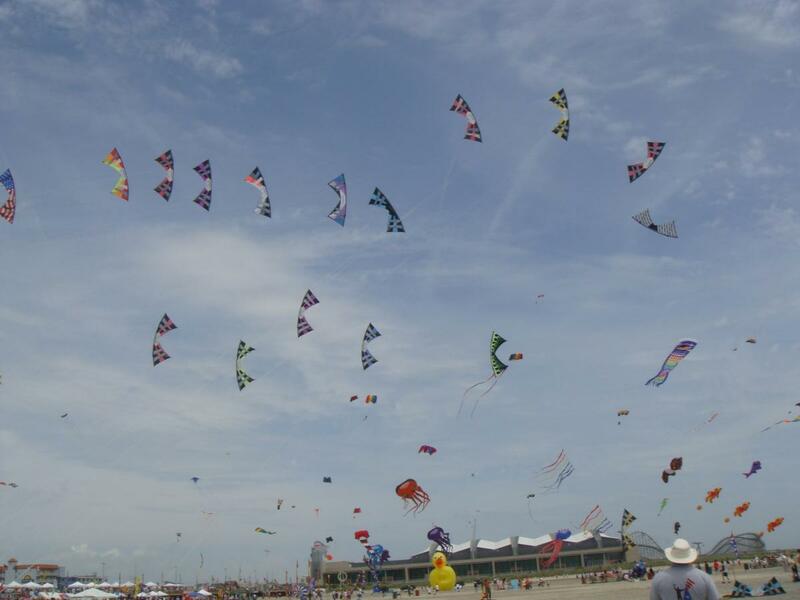 So, it’s that time of year again when I begin communications re the Wildwoods International Kite Festival. Attached (if applicable) is the registration form, which will also be available on the Sky Festivals web site soon. The Eastern League will also be posting this on their web site shortly as well. If you can’t wait and want it sooner rather than later, feel free to email me and I’ll email it to you directly. This year’s looking very strong, with some guests who haven’t been around in a while and a new activity, though more on that in my next communication! Mark your calendars for this year’s event and I truly look forward to seeing everyone again in just 3 short months! As I promised, the “light at the end of the tunnel” has arrived – spring has sprung! With WIKF only seven (7) short weeks away, there’s a boat load of things to share with you! Guests: We have some wonderful folks joining us this year, some who haven’t been with us in a while and others who have never been with us. Characters includes Barry “Baz” Poulter; Kathy Goodwind; Tony Jetland and his other half Jennifer; Steve DeRooy; Meg Albers & her cousin Nancy Houston; and, thanks to the generous assistance of the South Jersey Kite Flyers (SJKF), Gary Mark and Walter Corsetti. There still may be a few folks added to the list which I’ll share with you in the next post. With just this guest list alone, I truly just can’t wait until WIKF to see these folks, I feel like a kid in a candy shoppe! Yes, we’re going to have some fun! Event “Selfie”: Be sure to be a part of THIS photo op! While we may not crash Twitter like Ellen did at the Grammy’s (? ), we’ll be sure to set the kiting world on fire with THAT photo! SJKF: Where do I begin with this group of characters? The true “rock” club of the event, SJKF will once again host the Friday Night Social poolside at the host hotel, the Oceanic. The cost is a mere $10 per person for an all-you-can-eat buffet filled with some of the best food this side of the Mississippi. Festivities begin at 6:00pm. PLEASE FEEL FREE < J > to help them out with food donations and / or assistance prior to 6:00pm with food prep, table set up, food/cookware transportation, etc. There is a BOAT LOAD of work that goes in to making this Social happen so if you can spare even just a short period of time during the day on Friday, it would very, very much appreciated. Cel Dallmer is spearheading this festivity and she can be reached via mobile phone at 215 805 7498 or via email at cdallmer@verizon.net with your commitment to food donation and/or to time in assisting. Kite Makers Competition: Once again this year we will have a Kite Makers Competition. Via the generosity of SJKF, the Scott E. Spencer Memorial Kite Makers Competition will include cash prizes and AKA membership! There are varied categories and a myriad of details about the Competition which all can be found on the WIKF Registration Form (available on our web site, www.SkyFestivals.com > Events). Be sure to check out this info and more importantly, “strut you stuff” by showing yourself and the kiting world what you’re made of! Auction: This year’s auction is once again shaping up very nicely! As always, if you have an item or items you’d like to donate, we’re more than happy to accept them. Whether you donate or bid, we sincerely appreciate your support! Crossing fingers and hoping I'll be there. If anyone has a spare couch I could crash on, please let me know. Someone pls hook Carolyn up with a couch or better yet a bed. She deserves more than anyone I know, to be at WW having a kickass time. If I was going to be there I would, so somebody please fill in for me and help Carolyn with a bed to crash in!!!!!! Awwwww, Rich! You're not going to be there this year??? Pouts!!! Thanks always for the kind support. Worst case scenario for me will be driving down for one of the days (car willing). I hated missing last year, and I hate missing all of my flying friends! Alrighty, a dear friend has made me an offer (my eternal gratitude to you!). So… car willing, I plan to be there! Registration Forms: If you haven’t already sent your completed registration forms, PLEASE do so ASAP. Remember, even if you’re flying for fun on our fields, we do need you to complete a registration form, for insurance purposes. Guests: A partial list of our guests include Meg Albers, Gary Mark, and Walter Corsetti to name a few; additional guests will be provided in my next post! Starting the weekend off will be the annual “Unlocking of the Beach” ceremony being held on Friday at 12:00pm. While in all previous years this has taken place on either the east or south sides of the Wildwoods Convention Center (WCC), this year’s ceremony has a new location – two blocks north of the north side of the WCC. The reason you ask? Wildwood is unveiling a new addition to their old-time theme with a “Wildwood Icon Wall Mural” which will highlight varied individuals from that era. Naturally with this being their first mural, it will highlight Bobby Rydell who sang “Wildwood Days”. And guess who’s going to be in attendance to unveil that wall mural? Yup, Bobby Rydell himself – who may just sing that oh-so-familiar boardwalk song we hear all summer! So be sure to be a part of this very cool event by flying your spectacular kites at this new location! I’m working on seeing if we can get beach vehicle transportation from the kite sales tent area to this new site & back again – no promises yet, but I’m working on it! New this year is a mass ascension which will take place on Saturday in Sunday at 10:00am on Field 1. Saturday’s theme is Arches while Sunday’s theme is Trains! Kite Sales will once again take place in the tent at Rio Grande Ave on the beach. Offerings include manufacturers Dallmer’s Ducks; Gomberg Kite Productions; HQ Kites; New Tech Kites; Prism Kites; Revolution Kites; Skydog Kites and of course, a few miscellaneous items. Why not stop by and check it out – and don’t forget to check out this year’s event TShirt! Auction: The deadline for shipping auction donations is fast approaching – Monday, May 12 is the final receiving date. Post this date, we will gladly accept your donations on site. As in previous years, credit card will be accepted! As always, thank you all for your support in whatever capacity you participate in with this aspect of the festival! Well, that’s it for now. I’ll be back with additional updates soon. All my best to you all and I can’t wait to see you all! Friday thru Monday for me. Sigh. No Wildwood for me...because of the trip to Nairobi for the Kenya Kite Festival. Have to keep the spouse happy. But I've already told Marc that, regardless of any international trips early next year, there's no way in hell I'm missing the 30th Annual. Can you bribe him with a couple extra issues of Railroad magazine? Thats "Trains", and no. The only thing I could bribe him with would be a decent hotel in Wildwood. But it's already too late for that this year -- we're going to Madison, WI to visit some family. Well, we’re three weeks away and counting – after the winter and spring (?) we’ve had, it hardly seems possible! Here are the latest updates . . .
Memorial Fly: Our annual memorial fly will take place on Sunday at 11:00a.m. There are so many folks this year to remember and to celebrate their lives. For those of you who knew Max Robbins (Jason Robbins’ son), be sure to stop by the Festival Field tent if you’d like to sign a special kite Jason will have out for Max. ECSKC: Once again this year the East Coast Sport Kite Championships will take place with Jared Haworth of the Eastern League spearheading the competition. Jared has done a spectacular job in ensuring all things ECSKC related run smoothly, all for YOU, so be sure to give him a great big pat on the back and let him know how appreciated his is – and be sure to register! Jared follows in the foot steps of other great Eastern League Commissioners and he’s done a fine job at it! Dennis “Smitty” Smith will, as always, be our sound man – Thank you, Smitty! Registration Forms: If you haven’t already sent your completed registration forms, PLEASE do so ASAP. Remember, even if you’re flying for fun on our fields, we do need you to complete a registration form, for insurance purposes. The pre event registration deadline is a week from today, Saturday, May 10. Whether for this event or any event, it significantly helps those involved in any way (and trust me, as in many things, there’s a domino effect) with registration to receive these in advance, so please, be sure to get these in asap – thank you! Guests: Some of our other esteemed guests this year include Barry “Baz” Poulter, Tony Jetland, and the always beautiful Kathy Goodwind. And for those of you who remember him, John Rose will be around this year with his daughter Kerri (who is now 17-where has the time gone?)! I’m working on one more “throw back” guest, so we’ll see how that goes! Sunday Night Dinner: Be sure to sign up on site at the registration side of the tent for Sunday night dinner at Little Italy! Once again dinner is slated to take place at 7:00pm and we will have the side dining room to ourselves (for the most part). It is a short 5 block walk (or ride) and is a BYOB restaurant (there is a liquor store just around the corner!). They have a spectacular menu with something sure to fancy even the pickiest of taste buds. Feel free to check them out in advance at http://www.littleitalywildwood.com. Auction: I’m soooooooo excited about this year’s auction - there are some spectacular items that will be going out for bid!!! And if you’d like a clue, just look at some of the folks who are our guests! As always, cash and credit card are accepted. If you have a little something or something’s that you’d like to donate, we’re more than happy to accept and we appreciate your offerings! The auction is a major revenue generating aspect and helps significantly to keep the event going – so feel free to stop by and see what all the chatter’s about. And of course, bid on that beautiful piece you have your eye on! J “Mystery Baskets” will be bountiful! Remember, we’re only three weeks away – get your things together & packed; pray for excellent weather; and let’s get this party started!!!!! One week and counting – whooooo-hoooo! A special “guest” – for those of you familiar with the movie via 20th Century Fox & Dreamworks, “How To Train Your Dragon”, the sequel, “How To Train Your Dragon 2” will be released soon. With that, I am ecstatic to share with you that a kite produced by Peter Lynn for the character “Toothless” will make an appearance and fly at WIKF!!!! Come and see this bold, large, and very unique kite flying alongside you on Saturday! Another special guest is “my brother from another mother”, Blake Pelton and his lovely wife Olivia who will be joining us this year! ECSKC – if you’re a novice, or any category flyer, WIKF is a great place to get your feet whet! Be sure to register on site. Jared Haworth and Will Smoot are happy to report that competition numbers increased last year – let’s keep the momentum going AND growing, and perhaps one day we can re live the days of “multiple heats” in given categories! Kite Sales – for those who are interested in car collectibles, we have a very unique offering this year – Shelby Collectibles! In extremely limited supply, we’ll have on hand everything from radio controlled cars to packages with track and cars to individual cars. Some of the items aren’t yet even available in stores so come on in and check them out! Of course, the normal and customary kites, accessories, event T Shirts and Dallmer Ducks will be available as well. Sunday Evening Dinner – don’t forget to add your name on site to the Sunday dinner list at Little Italy. The response for this to date has even surprised me. This is when I personally begin to be able to breathe a little and I so enjoy it – it’s so great seeing all of the kiting folks together breaking bread and consuming adult beverages (remember, this is a BYOB restaurant)! As we do every year, seating will begin all at one time, when I arrive, as per the restaurant’s request. It’s important to keep in mind that they are doing us a huge favor by taking such a large party on one of their three busiest nights of this weekend. Checks will be provided on a PER PARTY basis, not on an individual per person basis – we ask that you please be patient and understand that not everyone’s food will arrive at the same table at the same time (unless of course it’s all on the same check). A Great Big Thank You – to all of you who will be attending; those making any contributions that I don’t see or hear of; to our guests; our sponsors; and especially to the FABULOUS Operations Team that helps in putting this event together. While I know I always tell you, I really want to acknowledge you publicly – THANK YOU SO VERY MUCH for all that each of you do, it is always so very, very much appreciated! Now let’s party, shall we?!!!!!! FYI, if anyone is still looking for lodging, I have one room open and available at our host hotel, The Oceanic. It is an oceanfront room, one queen bed, three nights, $300. If you're interested, give me a shout on my mobile at 732 822 4884 or email me directly at bpelton@SkyFestivals.com. First come, first serve. almost ready, a few items yet to inspect or collect, it hurts just thinking about it! are they defective, after all that no-thumbs (Dennis styled training) being instilled upon 'em? I never owned a BLUE kite, maybe that's the missing component to beat you just one time sir? AWWWWWW! I can feel the love!!! !